The writer’s personality seeps into the words they write. I remember reading somewhere that everything that the writer is, has been, has seen, has felt is contained in the words they write, whether they talk about those feelings or experiences or not. For a reader, it can be a delight to learn something about the writer intuitively. Across time and space, a packet of information passes between the writer and the reader, and they are connected. I recently had this experience when it dawned on me that Laura Ingalls Wilder was likely extremely sensitive to sounds. As someone sensitive to sounds myself, I see the signs peppered all through the Little House books. Hundreds of meadow larks were rising from the prairie, singing higher and higher in the air. Their songs came down from the great clear sky like a rain of music. And all over the land, where the grasses waved and murmured under the wind, thousands of dickie-birds clung with their tiny claws to the blossoming weeds and sang their thousands of little songs. Near the pigpen Pa and Uncle Henry built a bonfire, and heated a great kettle of water over it. When the water was boiling they went to kill the hog. Then Laura ran and hid her head on the bed and stopped her ears with her fingers so she could not hear the hog squeal. “It doesn’t hurt him, Laura,” Pa said. “We do it so quickly.” But she did not want to hear him squeal. In a minute she took one finger cautiously out of an ear, and listened. The hog had stopped squealing. After that Butchering time was great fun. Laura hears with the same sensitivity the songs of meadow larks and the squeal of a dying pig. The same sense brings her the most pleasure and the most pain. As much as screechy, noisy, abrasive sounds bring me down, musical notes fill me up. My sense of sound has in it the ability to uplift and delight me. A little music box I bought from the wonderful Getty Museum on my travels to Los Angeles last year sits on my desk. A picture of the tranquil Water Lilies in the evening adorns it. If I rotate the little handle of the box, I am filled with delight at the beautiful notes of Vivaldi’s Four Seasons. If I rotate the handle really fast, it is a joyful season full of dances and spring and happiness. If I rotate it really slow, it is a sorrowful, haunting melody of endings and pain. But no matter what the season, the notes are magical. 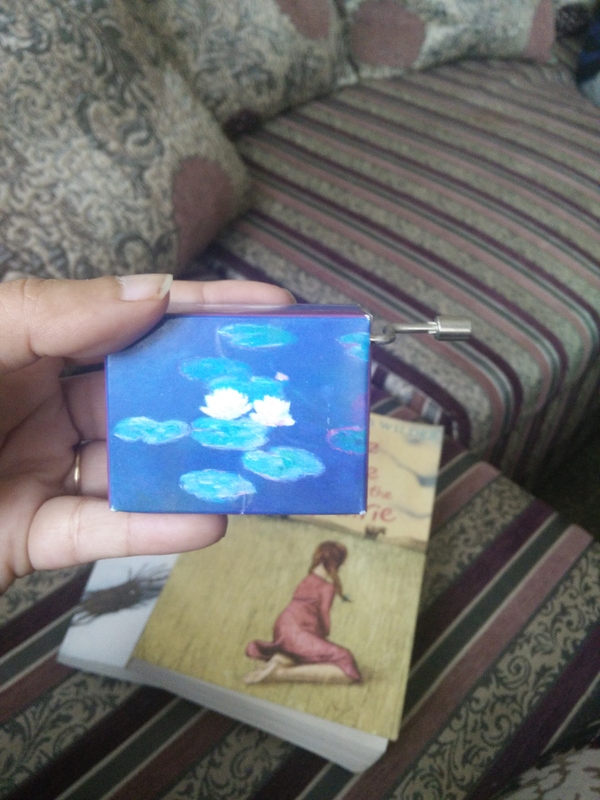 This little box which holds magic and music is my thing of beauty, a joy forever. Did you enjoy this post? Do share with those of heal and suffer from the sense. And may with someone who loves Little House and Laura! Do follow the blog via email or WordPress for posts on creativity, generosity, and living better.